There’s nothing worse than starting up your car and realizing something just isn’t right - your brakes are squeaking or your window is stuck or maybe it just feels “off.” That’s when you get that sinking feeling in your stomach: you need to visit a mechanic and there’s no money in your bank account for this unexpected expense. One way you can help prevent repeated trips to the mechanic for repairs is by keeping up with your car’s regular maintenance, and fixing small problems as they arise. With a little confidence, you might even be able to do some of this work yourself. 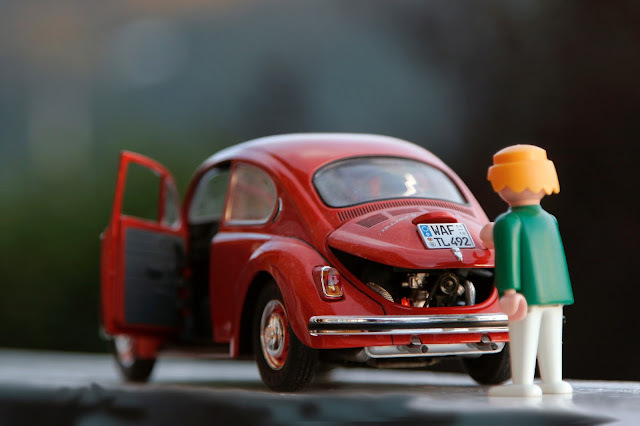 Check out this list of five car repairs you can do yourself; all you need is your owner’s manual, a quick YouTube tutorial, and an auto parts store that you trust. The rest, well, it’s up to you! When your air filter is too dirty, it impairs your engine’s function and impacts your gas mileage; changing it regularly will help prolong your engine’s life. How often you change your filter will depend on how much you drive, but your owner’s manual should have information on when you should be checking it out. If it’s dirty or clogged, it’s time for a new one. Air filters are generally inexpensive and can be purchased at an auto parts store. This is an easy job that should only take you a few minutes - and might boost your confidence to try some other quick fixes. When you start to notice your windshield is looking a little streaky, it’s probably time to change your windshield wipers. Other giveaways include squeaking or skipping wipers, or noticing that your wipers aren’t making proper contact with your windshield. Having good visibility when you’re driving is a matter of safety, so don’t put off this simple fix. This is another easy job that doesn’t warrant a trip to the mechanic’s. The timing on this one is a no-brainer - you need a new headlight or taillight when your current bulb burns out. Your owner’s manual should give you the information you need to buy the right bulbs. You might also start to notice your headlights becoming foggy or less bright. This is also a problem you can fix yourself with a headlight restoration kit. Not only will your lights be shining brightly after this easy job, but it will also freshen up the look of your car. Rotating your tires refers to changing the position of your tires to even out tire wear. Doing this regularly will help to extend the life of your tires, so you’re not paying for replacements more than is necessary. If you know how to change a tire, you have the skills to tackle this job (and if you don’t, it’s a good thing to learn). You can also install your winter tires when the time comes, something that will keep you safe in cold and snowy weather and could qualify you for a discount on your car insurance. Surface scratches and scuffs on your car don’t just look bad, they also put you at risk for further rust and damage to your car’s body. That being said, you don’t have to run to the auto body shop every time you ding your vehicle; many surface scratches and scuffs can be repaired at home. You can keep some touch-up paint on hand - just make sure that you have the proper colour for your car. The factory paint code should be found on a sticker under the hood or inside your door. A quick search online will give you many cheap but effective ways to handle touch-ups yourself and keep your car beautiful. Whenever you decide to handle a repair job yourself, make sure you are consulting your owner’s manual and doing your research. If you’re unsure that you can handle a project, it might be best to leave it to the pros. If you can tackle a few small jobs, though, you’ll save money and learn some new skills that you can brag about later.